If you drink coffee, you're not alone. According to Harvard T.H. Chan School of Public Health, over 54 percent of Americans over age 18 drink the rich brew. Research suggests coffee has health benefits, but for how it impacts iron, the news isn't all good. Coffee doesn't leach iron from the body, but it may prevent your body from absorbing it. It's not coffee by itself that impacts iron levels, it's the caffeine and polyphenols it contains. According to the Iron Disorders Institute, polyphenols may prevent iron absorption. Tannins are astringent polyphenols that block iron absorption. Depending on the brew, one cup of coffee may block absorption up to sixty percent. A 2004 study showed caffeine binds to iron, potentially preventing iron absorption but not by much. However, the combination of caffeine, polyphenols, and tannins in coffee may be problematic for some people. Does Coffee Affect Vitamin Absorption? What Is the Link Between Caffeine and Vitamin D? Research shows calcium blocks iron absorption, as well. If you add dairy products to your coffee, such as milk or creamer, it may also contribute to low iron levels in your body. Some people claim oxalates in coffee prevent iron absorption. While it's true oxalates slow the absorption of non-heme iron, the amount of oxalates in coffee is very low. To put it into perspective, spinach has about 793 mg of oxalates while brewed coffee has 0.9 mg. You'd have to drink gallons of coffee each day to consume enough oxalates to prevent iron absorption. Coffee doesn't prevent all types of iron absorption. There are two types of iron: heme and non-heme. Heme iron is found in meat, fish, and poultry. Non-heme iron is found in vegetables and grains. Heme iron is generally better absorbed than non-heme iron. According to Dr. Andrew Weil's website, the tannins in coffee affect absorption of non-heme iron, not heme iron. According to Consumer Reports, results of one study showed drinking coffee with a meal decreased non-heme iron absorption by 34 percent. Most people get plenty of iron in their diets and will not experience iron deficiency from drinking coffee. However, if you're a vegetarian and consume very little iron, or you suffer from iron deficiency anemia, you should avoid coffee, tea, and other caffeinated beverages. You should also avoid decaffeinated varieties since they also contain tannins. Since anemia often causes vague symptoms that can be attributed to stress and overwork, you may have it and not know it. 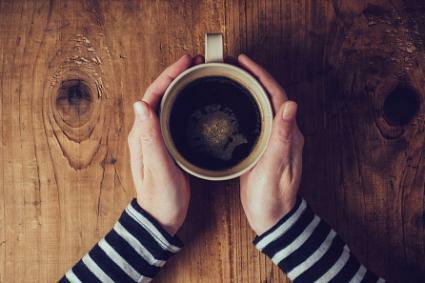 Drinking coffee may make the condition worse, so if you have any persistent symptoms of low iron, talk to your doctor. Increase your heme iron intake. Eat foods containing ascorbic acid (vitamin C), such as oranges, cantaloupe, strawberries, broccoli, tomatoes, and cauliflower along with iron-containing foods to increase absorption. Instead of drinking coffee with meals, enjoy your cup of joe at least one hour before or after eating. Drink your coffee black or add non-dairy products, such as almond milk, rice milk, or non-dairy creamer. Cook foods in a cast-iron skillet. If you already have enough iron in your body or you have hemochromatosis, drinking coffee with milk during meals may help prevent excess iron absorption. Drinking coffee with meals limits iron absorption, but for the average person it isn't a problem. If you know you have low iron, you experience symptoms of low iron, or you're pregnant, you should avoid drinking coffee or only drink it occasionally between meals.